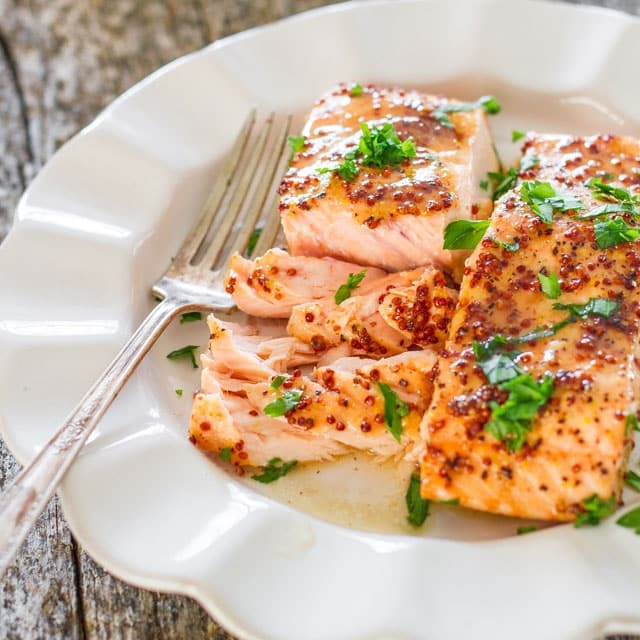 Maple Mustard Glazed Salmon – 4 ingredients turn this salmon into a super star. A healthy and delicious salmon, glazed with maple syrup and grainy mustard. I should add super simple to the title of this recipe because that’s just what this is and best of all it’s ready in just 20 minutes and requires only 5 ingredients that you probably have in your pantry or fridge right now. Being on my forever quest to eat healthier I bought a beautiful piece of salmon fillet from my local grocery store. I cut this piece of salmon in 6 fillets and made a wonderful glaze with butter, maple syrup, mustard and soy sauce. I love the simplicity of this recipe and make it often. I love to serve it with this roasted broccoli or this lemon orzo with asparagus. I hope you guys try this recipe, because it’s one of our favorite here. The salmon makes for a perfect weeknight meal for when you want something quick but still full of flavor, delicious yet healthy. 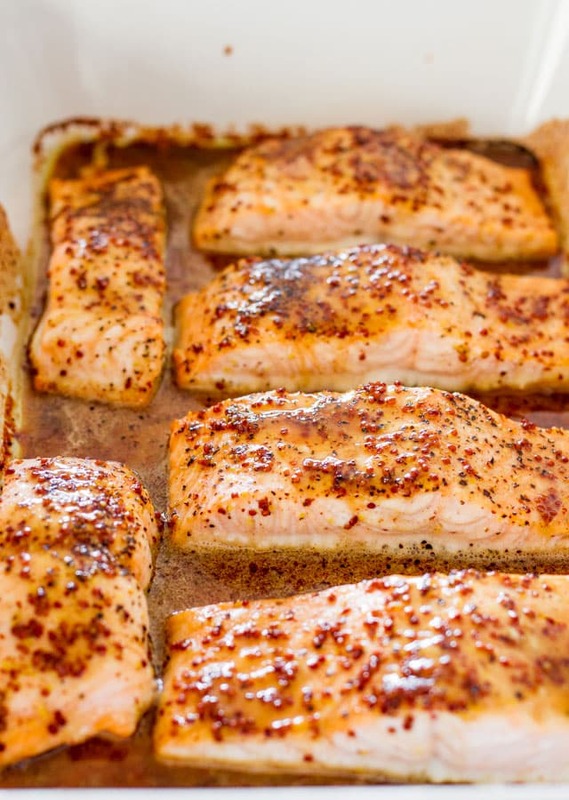 When you take this salmon out of the oven, it will smell heavenly. The salmon is super flaky, and the flavors are amazing. 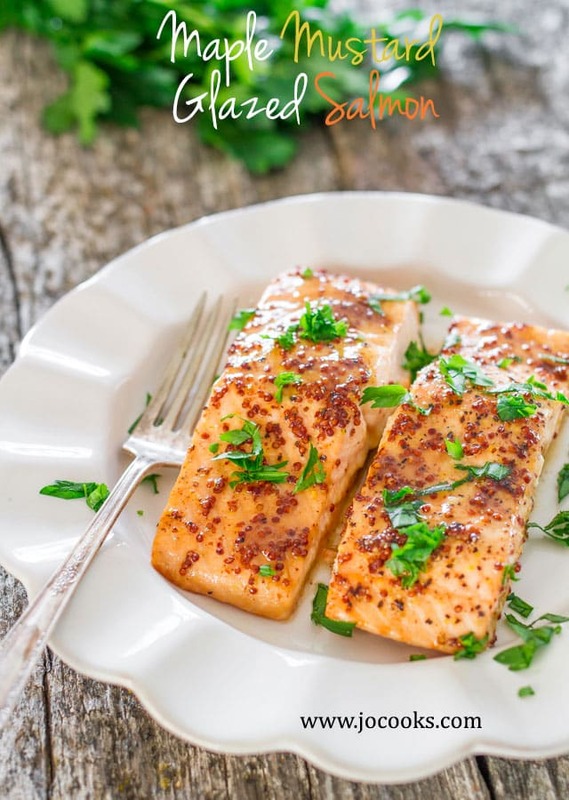 Maple Mustard Glazed Salmon - 4 ingredients turn this salmon into a super star. 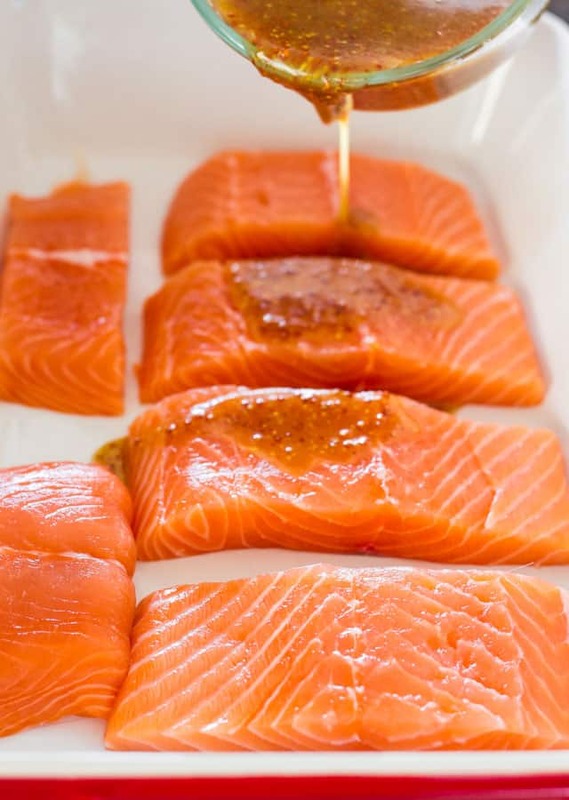 A healthy and delicious salmon, glazed with maple syrup and grainy mustard. Arrange the salmon fillets in a 9x13 inch baking dish. Bake for 15 to 20 minutes or until salmon flakes with a fork. This sauce would also work great on other types of fish as a red snapper or cod. Made this today, absolutely delish! Thanks Jo for sharing. This was FABULOUS, I made the Lemon Orzo with Asperagus , also FABULOUS, as the side, very gourmet and easy. Thank you for the recipes, definite keepers!!!!! Yum! That sounds like such an awesome dinner. We’re glad you’re loving our recipes! This was a great success. The salmon came out perfect, not too rare and not to done. The sauce is fabulous. I agree with the idea it can be used for other fish…but it would be hard to turn down the salmon. It is on the regular rotation now. Tried this recipe. Turned out fabulous. My family loved it. Thankyou so much. Would like to receive more such recipes in future. My pleasure. Don’t forget to subscribe to Jo Cooks newsletter and you’ll always receive all new recipes. Loved this recipe! My husband was super impressed with my culinary skills on this one. I’m back on this page, about to make it for my mother, my toughest critic. This was so good! All my guests loved it. This is a five star recipe. Always impresses. I always do a honey-mustard salmon by default, but I got a little tired of my usual flavors and ended up here – maple syrup?! Yum! I was very surprised by the change of flavor, definitely better than what I usually do. Thanks for sharing! My husband asked for a maple glazed salmon recipe, and this was just what he wanted! I made this for my friend’s birthday and she is a very picky eater. She loved this and so did my family. Can you just use regular Dijon mustard? I don’t think regular Dijon mustard would work in this recipe, you’re looking for a one that’s a bit grainy. OMGoodness This is amazing. This is my fav recipe to make salmon. I have never had salmon this good in my life…5 stars all the way.